A USB device controller enables a mass-storage device to share its data with other computers. For example, a data logger can collect data in the field and then connect to a PC, where an application reads the data from the logger’s storage media. Or a robot can attach to a PC to receive a file containing configuration data to use in robotic tasks. Flash-memory cards provide convenient storage for many small systems. Other systems function as USB hosts that can access files in off-the-shelf USB flash drives and hard drives. 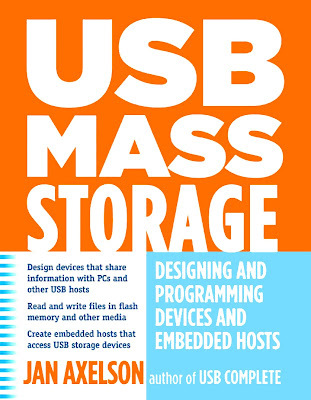 If you’re involved with designing or programming devices that incorporate a USB mass-storage device or host interface, this book will help you get your projects up and running. You’ll also find the book useful if you’re designing or programming devices that use flash-memory cards for data storage, whether or not the devices have USB interfaces. Un controlador de dispositivo USB permite a un dispositivo de almacenamiento masivo compartir sus datos con otros ordenadores. Por ejemplo, un registrador de datos se pueden recopilar datos en el campo y luego se conectan a un de PC, donde una aplicación lee los datos desde medios de almacenamiento del registrador. O un robot puede conectar a un de PC para recibir un archivo que contiene los datos de configuración para utilizar en tareas robóticas. Tarjetas de memoria flash proporcionan un almacenamiento conveniente para muchos sistemas pequeños. Otros sistemas funcionan como hosts USB que pueden acceder a los archivos en unidades flash off-the-shelf USB y discos duros. Si usted está involucrado con el diseño o la programación de dispositivos que incorporan un dispositivo de almacenamiento masivo USB o interfaz de host, este libro le ayudará a conseguir sus proyectos en marcha y funcionando. También encontrará el libro sea útil si usted está diseñando o dispositivos que utilizan tarjetas de memoria flash para almacenamiento de datos de programación, si los dispositivos tienen interfaces USB. Mass Storage Basics. When to Use a Storage Device. Benefits. Other Considerations. Requirements. Devices. Embedded Hosts. Selecting a Media Type. Drive Mechanisms. Addressing Methods. Reading and Writing Considerations. Removable Media and Devices. Hardware Interfaces. Hard Drives. Technology. Interfaces. Flash Memory. Technology. Options for Flash Memory. MultiMediaCard. SD Memory Card. CompactFlash. Supporting USB. The Interface in Brief. Hosts and Devices. Host Responsibilities. Device Responsibilities. Bus Speeds. Endpoints. Transfer Types. Transactions. The Data Toggle. Descriptors. Mass Storage Requirements. Choosing a Device Controller. Controllers with Support for Flash Memory. Controllers with support for ATA/ATAPI. Firmware Options. Microchip PIC18F4550. Architecture. Firmware Support. The USB Controller. The USB Mass Storage Class. Requirements. Specifications. Logical Block Addressing. Mass Storage Requests. Descriptors. Device Descriptor. Configuration Descriptor. Interface Descriptor. Endpoint Descriptors. String Descriptors. Responding to Commands. The Command Block Wrapper. The Command Status Wrapper. Managing Communications on the Bulk Endpoints. More about STALL. Thirteen Cases for Any Situation. PC Support. Windows. Linux. Accessing Flash Memory Cards. The Interface. Signals and Power. Example Circuit. Host Programming. Configuring. Hardware Ports. Firmware-controlled Ports. Transferring Data. Default States. SPI on the PIC18F4550. Configuring the Port. Writing a Byte. Reading a Byte. MultiMediaCard Protocol. Command and Response Formats. Commands. Response Types. Token Formats. The Commands. Classes. Commands Used by Mass-storage Devices. Registers. Sending Commands. Timing Considerations. Commands with No Data Transfer. Commands that Read Data from the Storage Media. Commands that Write Data to the Storage Media. Application Example. Detecting and Selecting a Card. Sending a Command. Reading a Sector. Writing a Sector. Initializing Communications. SCSI Commands. About the Commands. Specifications. Which Commands to Implement?. Sense Data. Fixed-format Sense Data. Setting Default Values. Primary Commands. Inquiry. Mode Select. Mode Sense. Prevent Allow Medium Removal. Report Luns. Request Sense. Send Diagnostic. Test Unit Ready. Es verdad lember leigue sos el 1º en comentarios. Gracias por tu apoyo. Que paso profe, porque ya no sube mas libros? Espero que vuelva a subir como antes.